John roasted some coffee and created another mystery blend this past weekend. We’re going to test these beans very soon and I’ll find out exactly what the mystery blend is. 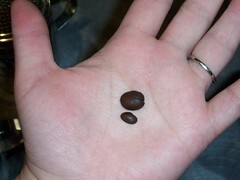 I spotted different size beans in the blend. I mean, some of the beans are giant while the others are tiny!